Karl Robin Bendetsen (October 11, 1907 – June 28, 1989) was born in Aberdeen, Washington. His parents, Albert M. and Anna Bendetson, were first-generation American citizens. Karl changed the spelling of his last name during early 1942, and would later make written claims to descent from Danish lumbermen who had come to America as early as 1670. Bendetsen is remembered primarily for his role as architect of the internment of Japanese Americans during World War II (a role he tried to downplay in later years). Bendetson (as he was then known) enlisted in the Washington National Guard, at the age of fourteen. While this was well below legal age, the National Guard turned a blind eye to the many young men who desired to enlist while who were still in—or, as in Bendetsen's case, had yet to enter—high school. As he matured, Karl entered Army ROTC, eventually taking an infantry commission in the Army Reserve. Bendetson, now a major, was on the administrative staff of Judge Advocate General Major General Allen W. Guillion. In early September 1941, Bendetson was sent to Hawaii to discuss the need to intern enemy aliens in case of war. He stated in his notes that there were 134,000 American citizens of Japanese descent in the islands, and worried that "good Americans" might "give Japs the benefit of the doubt" for economic reasons. In November, Bendetson was sent to take over an aircraft plant in New Jersey, as part of a plan by President Franklin D. Roosevelt to boost production of factories making materiel needed by Great Britain. Major Bendetson was given this assignment after having written the orders for seizure and strike-breaking at a North American Aviation plant, but the army had taken charge of the Air Associates plant in October, prior to his arrival. In later years, however, Bendetsen would describe a wild scene of standing on his overturned car to face down the "mass" of strikers who had blocked his way into the plant. The strike settled, Bendetson was back at his own desk in early December. Immediately following the Japanese attack on Pearl Harbor on December 7, 1941, the Federal Bureau of Investigation arrested approximately 5,500 leaders in the Japanese American communities in Washington, Oregon, California, and Hawaii. While the government was worried that these leaders had been involved in anti-American activity on behalf of the Empire of Japan, eventually, all were cleared of any wrongdoing. However, President Roosevelt signed Executive Order 9066 in early 1942, which authorized military commanders to designate "exclusion zones", "from which any or all persons may be excluded" for reasons of military security. Following that authorization, Bendetsen (he had changed his name by this time) developed a plan by which all persons of Japanese ancestry, whether foreign-born alien or American-citizen "non-alien," were forced to leave the West Coast. He then pressured Lieutenant General John L. DeWitt to accept his plan, rather than the less-restrictive one which DeWitt had originally intended. Initially, only southern Arizona and the western parts of Washington, Oregon and California were designated as "Military Area No. 1," and many Japanese Americans simply moved to the eastern portions of their home states, while several thousand moved to other states. Bendetsen would later call this "voluntary relocation," though the moves were done at the orders of the government. The Western Defense Command then announced that the exclusion zone would be expanded to include all of California and created "Military Area No. 2," at the same time prohibiting Japanese Americans from leaving either military area. Only those who had moved outside California escaped being rounded up and confined in makeshift "assembly centers" (often horse stalls at racetracks and fairgrounds), and then later incarceration in "relocation centers." While Bendetsen and other supporters of internment cited military necessity (and continue to do so), reports by the FBI and by the Office of Naval Intelligence had stated that not only were vast majority of Americans of Japanese ancestry loyal, but likewise their parents (who had been denied American citizenship) were loyal to the United States and held no allegiance to Japan. Bendetsen also ordered that any person, no matter their age, who had "one drop of Japanese blood" were to be confined. This included the removal of infants and children from orphanages and the transportation of hospital patients, a number of whom died when their care was cut off. He would later claim that the orders were not so broad-sweeping, though even Military Intelligence Service officers of Japanese ancestry were forced to leave California. Throughout the rest of the war, Bendetsen and DeWitt opposed army orders that soldiers of Japanese ancestry be allowed to re-enter the coastal states while on leave or military assignment. The reason for opposition was primarily political, and the fear of ridicule when the soldiers had proven patriotic Americans while the government had spent millions of dollars to put those soldiers' families behind barbed wire. Bendetsen joined others who had been involved in the exclusion and incarceration to oppose the Commission on Wartime Relocation and Internment of Civilians hearings, which in 1983 determined that there had been no just cause for the actions taken against Japanese American communities during World War II. He was adamantly opposed to calls for reparations to be paid to former camp inmates and their relatives. After the war, Bendetsen's claims of his importance to the army and role in the war grew, while admissions of his role in the internment shrank. One of the greatest of these claims was given when interviewed in 1972 for the Harry S. Truman library. Speaking to historian Jerry Hess, Bendetsen claimed to have spent "late 1941" carrying "the title of Special Representative of the Secretary of War" to have conferences with Major General Douglas MacArthur in the Philippines. He also claimed to have stopped to meet with Lieutenant General Walter C. Short (the military commander in charge of Hawaiian defenses) and Rear Admiral Husband E. Kimmel (commander of the Pacific Fleet), leaving only days before the Pearl Harbor attacks. In this oral history, Bendetsen tells in great detail that the United Air Lines plane returning him from Hawaii had landed in Washington at 9 a.m. on December 7, with Bendetsen carrying "a personal and important message" from General Short to Army Chief of Staff George C. Marshall. He states that been told that Marshall was out riding his horse, "so why don't you go home, kiss your wife ... be here by 10 a.m." Then, Bendetsen continues, upon reaching the house an urgent phone call summoned him back to the office and he was told of the Pearl Harbor attacks "twenty minutes later." In early 1942, Karl changed the spelling of his name from "Bendetson" to "Bendetsen." In 1970, Bendetsen claimed (for the National Cyclopedia of American Biography) that he was "grandson of Benedict and Dora Robbins Bendetsen, and great-grandson of Benedict Benediktssen, who came to this country from Denmark about 1815 ..." In truth, Bendetsen's paternal grandparents were Samuel A. and Catherine Rabbin Bendetson, who were born in Germany (1830) and Poland (1838), respectively. In 1983, he took time from testifying in opposition to redress for Japanese American internment camp survivors to describe how his first Danish ancestor "came over here in 1670, decided he didn't want to be a sailor, he wanted to be a farmer ... my family has been in timber ever since." He also described selling lumber to Japanese ships. In truth, Bendetsen's family first entered the "timber" business after he retired from the army, when he became a general consultant for the Champion Paper & Fibre Company in 1952. 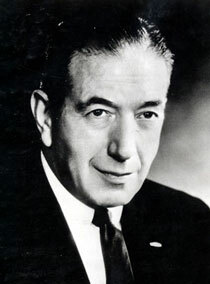 Rising to company president (the reason for the Biography entry in 1970), Karl was described as "ruthless" by his lifelong friends, who also were critical of his betrayal of his Jewish heritage. ^ a b c Oral history interview with Karl R. Bendetsen for Harry S. Truman Library, New York City, 1972. ^ a b de Nevers, Klancy. "Karl Bendetsen" Densho Encyclopedia (accessed 23 May 2014). ^ Densho. "About the Incarceration" (accessed 23 May 2014). ^ Niiya, Brian. "Voluntary evacuation" Densho Encyclopedia (accessed 23 May 2014). ^ Linke, Konrad. "Assembly Centers" Densho Encyclopedia (accessed 23 May 2014). ^ Weglyn, Michi Nishiura. Years of Infamy (Seattle: University of Washington Press, 1996) 76-77.
de Nevers, Klancy Clark (2004). The Colonel and the Pacifist. Salt Lake City, Utah: University of Utah Press. ISBN 978-0874807899. Retrieved 3 June 2016. Hess, Jerry N. (October–November 1972). "Oral History Interviews with Karl R. Bendetsen". Harry S. Truman Library & Museum. Archived from the original on 18 August 2000. Retrieved 3 June 2016. "Preliminary Inventory of the Karl R. Bendetsen papers, 1917-1989". Online Archive of California. Hoover Institution. Retrieved 3 June 2016. Selected documents from the Bendetsen Papers online at the Hoover Institution Archives, Stanford University. "Local Service Center For Japanese Opened: Office Will Aid Evacuees: Property Deals Will be Guided". Lodi News-Sentinel. 26 March 1942. Retrieved 22 June 2016. Johnston, Richard W. (1 April 1942). "Outline Program for Relocating Japanese". Berkeley Daily Gazette. UP. Retrieved 22 June 2016. "Acquire New Alien Camps". Berkeley Daily Gazette. UP. 1 April 1942. Retrieved 22 June 2016. "Japanese Evacuation Expected Soon: Personal Property Being Transferred: Assembly Center At Fair Grounds Expected To Be Complete This Week". Lodi News-Sentinel. 14 April 1942. "Japanese Centers Claimed Adequate". Prescott Evening Courier. 15 April 1942. Retrieved 22 June 2016. "Army Was Prepared". Spokane Daily Chronicle. AP. 21 May 1942. Retrieved 22 June 2016. "The Japs Move Into Temporary Quarters". The Deseret News. 27 May 1942. Retrieved 22 June 2016. "Army Completes Big Japanese Evacuation". Beaver County Times. United Press. 6 June 1942. Retrieved 22 June 2016. "100,000 Japanese Safely Evacuated: Not One Instance Of One Japanese Reporting Disloyalty Of Another". Lodi News-Sentinel. 9 June 1942. Retrieved 22 June 2016. "Will Move Japs to Tule Lake Project: Movement From Sacramento to Start Monday, Marysville to Follow". Lodi News-Sentinel. 13 June 1942. Retrieved 22 June 2016. "Army Will Evacuate Japanese at Turlock". Berkeley Daily Gazette. 17 July 1942. Retrieved 22 June 2016. "Japanese Centers To Be Moved Inland". The Pittsburgh Press. United Press. 12 September 1942. Retrieved 22 June 2016. "Award Bendetsen Army Decoration". Berkeley Daily Gazette. 19 November 1942. Retrieved 22 June 2016. Allen, Robert S. (26 September 1949). "Robert S. Allen Reports: MacArthur Wants Naval Strength In Pacific". The Evening Independent. Retrieved 22 June 2016. BURNT FINGERS: The White House is getting leery about sending controversial appointees to defense jobs to the senate. That is the inside reason for the delay on Kar Bendetsen, San Francisco lawyer, a assistant secretary of the army. Three powerful groups have voiced strong criticism of him. They are the Japanese American Citizens League, the National Association for the Advancement of Colored People, and the American Jewish Congress. Reason for their opposition is Bendetsen's connection with the eviction of Japanese-Americans from the West coast during the war. He was General John DeWitt's legal adviser in this action. Bendetsen's strongest supporters are Senator William Knowland (R.-Calif.), and the Native Sons of the Golden West. A letter from a Catholic priest may stop Senate confirmation of Karl R. Bendetsen of Aberdeen, Wash., sworn in Thursday as assistant secretary of the Army. The letter tells the story of Bendetsen when he was in charge of evacuating persons of Japanese ancestry from the West Coast during the hysteria of 1942. Writes Father Hugh Lavery of the Catholic Maryknoll Mission of Los Angeles: "(Bendetsen) showed himself a little Hitler. I mentioned that we had an aorphanage [sic]. I told him some of these were half-Japanese, others one-fourth or less. I asked, 'Which children should we send to the relocation centers?' (Bendetsen) replied, 'I am determined that if they have one drop of Japanese blood in them they must all go to camp.' Just as with Hitler so with him. It was a question of blood." Mike Masoaka, the Japanese-American war hero, has shown the letter to senators, many of whom are opposed to Bendetsen's confirmation as assistant secretary of war, especially since the strong court of appeals opinion written by US Judge Wm. Denman of San Francisco condemning the Army's treatment of Japanese-Americans. "Bendetsen Nominated As Army Undersecretary". Toledo Blade. AP. 24 April 1952. Retrieved 22 June 2016. "Internment of Japanese Civilians In WW II 'Necessary' — Colonel". The Hour. AP. 2 November 1981. Retrieved 22 June 2016. "WWII internment camps defended". Spokane Daily Chronicle. AP. 2 November 1981. Retrieved 22 June 2016. "Ex-colonel defends relocation of Japanese". The Spokesman-Review. AP. 3 November 1981. Retrieved 22 June 2016. "Camps Necessary To Protect Japanese, Ex-Officer Insists". Sarasota Herald-Tribune. UPI. 3 November 1981. Retrieved 22 June 2016. "Judge challenges lawyer over Japanese camps". The Montreal Gazette. UPI. 4 November 1981. Retrieved 22 June 2016. Einstein, David (6 December 1981). "Internment: A sad chapter in U.S. history". The Spokesman-Review. Associated Press. Retrieved 22 June 2016. "Internment deviser K.R. Bendetsen dies". Reading Eagle. Associated Press. 30 June 1989. Retrieved 22 June 2016. Hideichi Takeguma v. United States , 156 F.2d 437 (9th Cir. 1946). Acheson v. Murakami , 176 F.2d 953 (9th. Cir 1949). This page was last edited on 10 March 2019, at 20:52 (UTC).